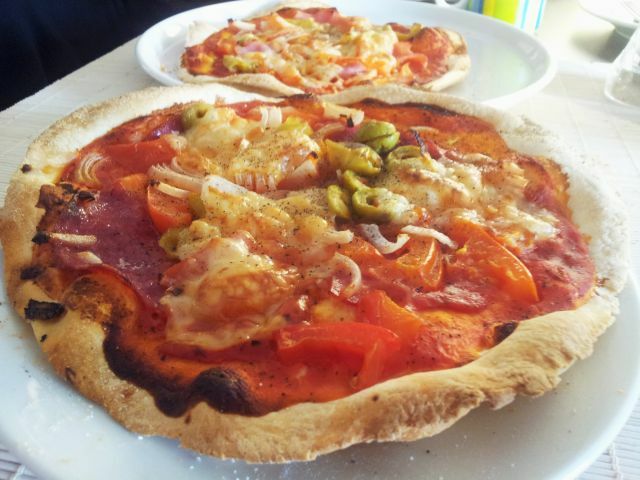 To prepare a brick oven pizza, no doubt, the most suitable apparatus would be a brick oven, wood fired. However, it is hard to come by at your home, and not quite viable to heat up such massive equipment just for one or two pizzas. Time to try out a present received for xmas, a brick, which fits my oven very well. The material is Schamotte, a Mullite-type Si-Al-Oxide material. Make sure to get a food grade stone, because many refractory bricks intended for industrial use contain heavy metals, and this is not what we want for the pizza. 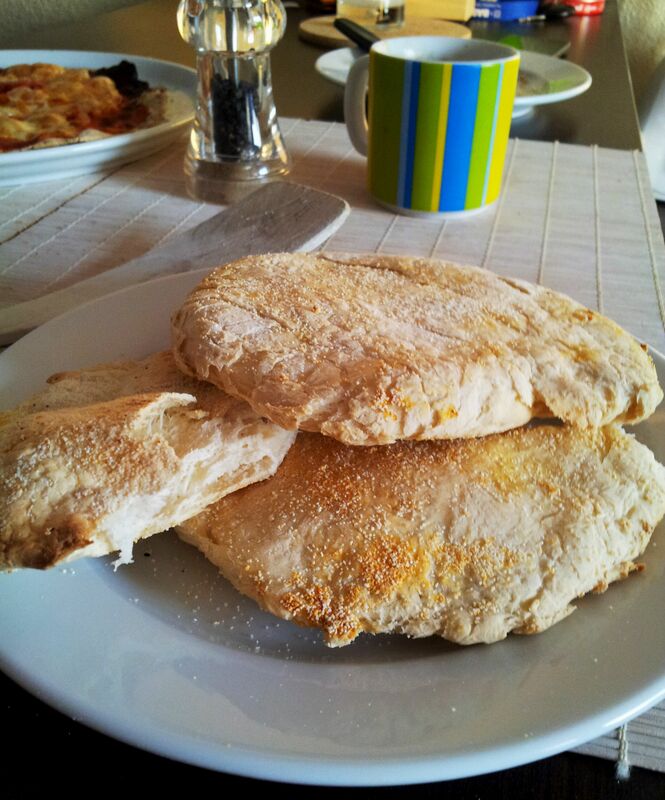 –> can be substituted by a mixture of 150 g of whole wheat flour, and 350 g of wheat flour. To prepare the dough, dissolve yeast and sugar in water, and add salt, oil, and about 3/4 of the flour. Mix thoroughly, add remaining flour, mix, and knead with your hands until the dough is nice and firm. Let rise for 1-2 hours, or longer, depending on temperature. 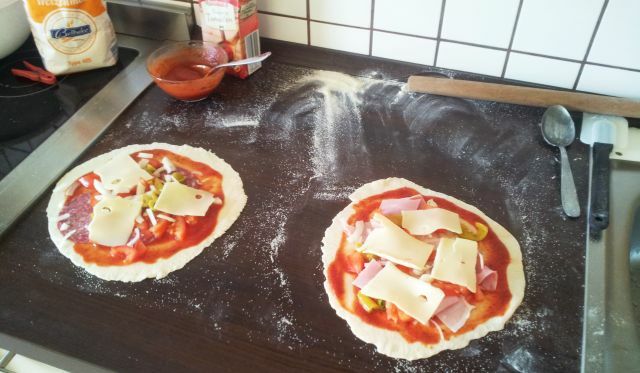 Form into round pieces, about 100 g each for small size pizza, and let these pieces rest for about 35-45 minutes. Above, this is what it should look like. 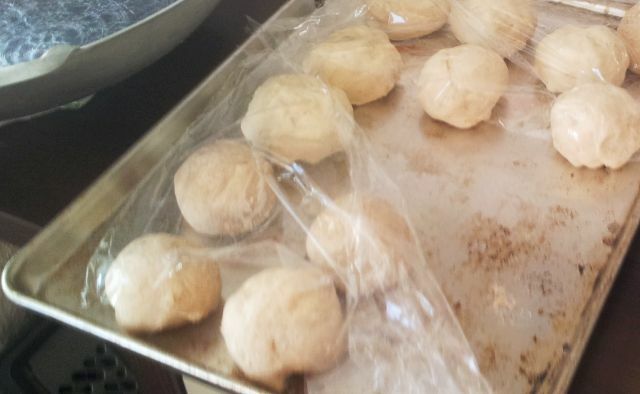 Then, roll out the pieces, without any further kneading, and use some flour and semolina as an anti-stick agent. Make sure the stone is pre-heated at full power, 250°C temperature. 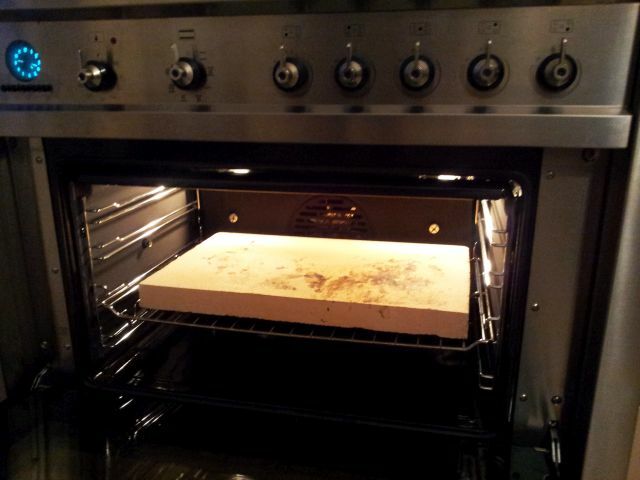 Put the pizza on a wooden panel of appropriate size to move it around, and slide it on the stone. Don’t add too much sauce, otherwise, the pizza might get stuck to the stone. Needless to say, there are many uses for the pizza stone, like, baking bread rolls, onion breads, or flat breads. A great opportunity for some experimentation!